Can you think of a movie or a TV series that has enacted how a drinking problem (or other substance use disorder) ruins someone’s career and/or relationship(s), or even causes death? You may be thinking “This is easy!” because there are so many! Unfortunately, the consequences such movies and shows depict are not purely fictional, and often reality is much worse. Substance use disorders are an illness and a severe problem all over the world. For example, a 17-year-old girl in my home country of Bangladesh killed her parents after they restricted her because they found out about her drug addiction. Horrifying, isn’t it? More than 23 million people in the United States abused alcohol and other drugs in 2014. There have been many different treatments and maintenance programs for recovery from substance abuse, among which 12-step fellowships like Alcoholics Anonymous (AA) and Narcotics Anonymous (NA) are the most popular. These are “12-step fellowships” that involve people regularly attending meetings where they sit in a circle and share about their recovery. With the advancement of technology, this well established tradition of in-person peer-support has been made available online. There is an online community called InTheRooms that hosts more than 100 weekly video meetings for people in recovery and their friends and families. People in recovery seek to maintain anonymity and they are wary about video mediated communication in general. 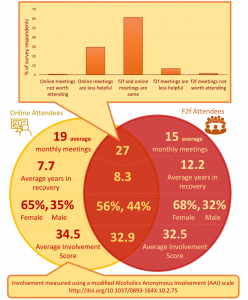 So how do these video meetings work, and does online recovery actually work? 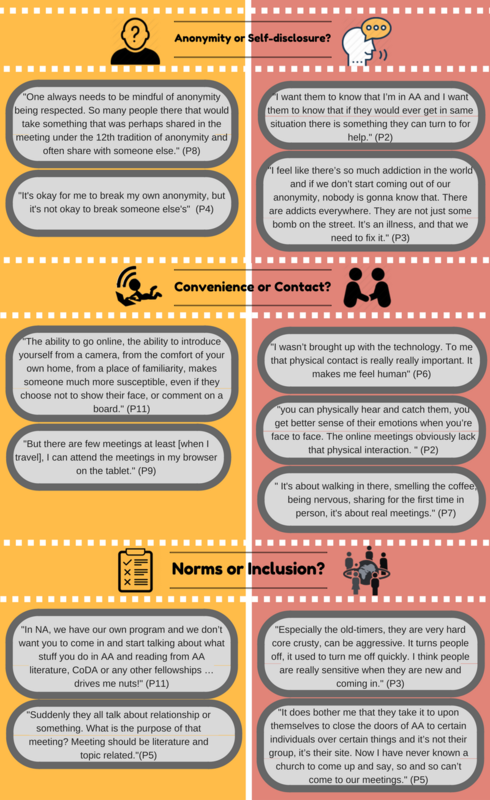 To answer these questions, we posed a questionnaire to InTheRooms members, and we interviewed active members to learn about their lived experiences in online meetings. Even though InTheRooms provides many features for social communication like profiles, wall posts, status updates, private messaging, instant messaging, discussion boards, etc., members primarily participate in the community via the video meetings. According to our survey, many people in recovery are often unable to attend face-to-face meetings due to disability or other health conditions, lack of transportation, or conflict with work schedules. Clearly, online meetings fill an important gap for these people, allowing them access to recovery options that otherwise would not be available. While participants thought that online meetings are as useful as those face-to-face, they also revealed some major tensions. Therefore, video-mediated peer-support can be a beneficial feature to many life-critical online health communities. However, some challenges emerging from these tensions need to be addressed to support such meetings, and to facilitate the online peer-support process. In face-to-face 12-step meetings, participants feel safe because they mostly know each other. In the case of online meetings, anyone who is a member of InTheRooms can join, and there are several thousands of active members! Besides, meeting attendees can choose to remain anonymous by not sharing their videos. The same aspect of remaining anonymous was a major concern to some of our participants: so many people in a meeting they are not familiar with and they could reveal whatever they heard in a meeting outside of the community. They were worried about losing jobs, or self-esteem to other circle of friends and family members. Most participants chose the option of “selective-disclosure” instead: they made close friends in the community over time and shared key aspects of their recovery with only them or sponsors who they trusted. The ability to attend from the comfort of one’s home is a plus for online meetings. However, our online meeting participants constantly mentioned how they missed the hugs, the handshakes, or smelling coffee; the physicality that comes with face-to-face meetings. This aspect has important implications for other online peer support groups (like PatientsLikeMe, 7 cups of tea, etc. ) that meet exclusively online. Although synchronous online means of communications have benefits over text-based ones, they should not entirely replace the face-to-face interaction. 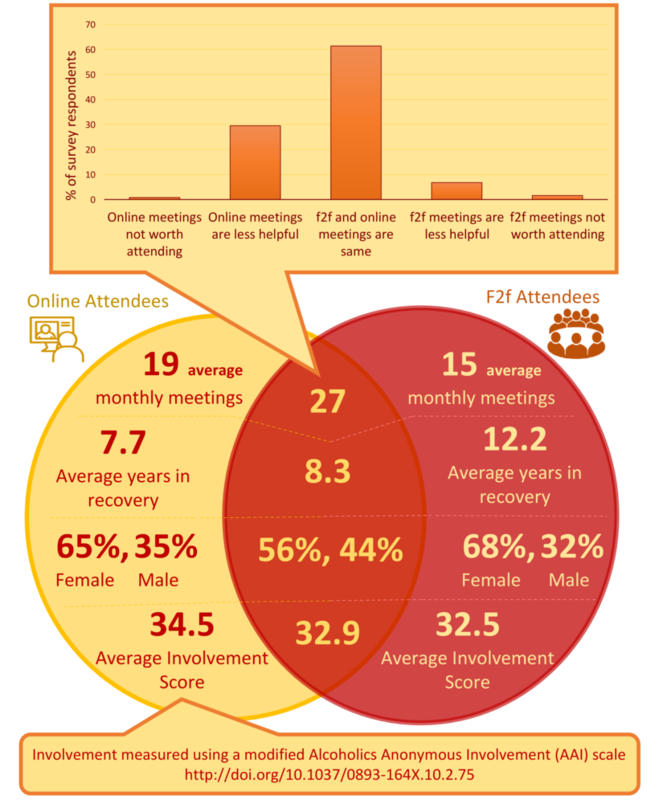 Most of our participants preferred to combine both online and face-to-face meeting attendance to get the best of both worlds. Unlike many other online communities, there is a necessity of constructive moderation and feedback from peers in life-critical health communities. Admins or moderators of these groups should be very careful of who to ban and for what reasons. Now you may think, what if someone abuses the website by trying to flirt or to solicit dates? That definitely goes against the norms of InTheRooms. But what if a newcomer is not aware of all the traditions and gets interrupted while sharing his problems because of a silly norm violation (for example, not introducing oneself as a member of a particular 12-step fellowship)? He may decide not to go to any more meetings and that may eventually cause a relapse. Our study participants reported this type of incidents, because interpretation of norms varies based on geographic location, and people with different interpretations can join the same online meeting. 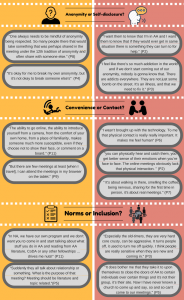 Norms seemed to lie at the core of the conflict experienced by online meeting participants. So online health communities should develop a consensus on specific group norms and policies, and they should be made transparent once established. And of course, if you’re interested, you can read a lot more about our study in our CSCW paper! Sabirat Rubya is a PhD student at the GroupLens Research of University of Minnesota. Her research focuses on recommending and designing better technology for users of online peer support health communities. She completed her bachelors in Computer Science and Engineering from Bangladesh University of Engineering and Technology. Before starting her PhD, Sabirat worked as a mobile application developer and as a lecturer.